Mufasa, an elderly mountain lion who spent 20 years chained up in the back of a circus pick-up truck, has been rescued by Animal Defenders International (ADI). He will live out the rest of his life at the Taricaya Ecological Reserve in the Amazon forest. ADI rescues Mufasa from the back of a circus pickup truck. Photo by Animal Defenders International. Mufasa at the Taricaya Ecological Reserve in the Amazon forest. 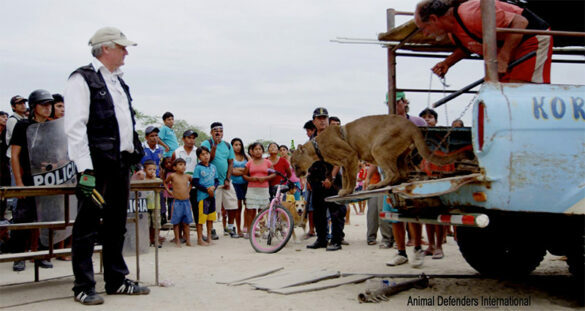 Photo by Animal Defenders International. If you would like to help ADI make more rescues, you can donate at their website. Learn more at www.ad-international.org/SpiritofFreedom. Photo by Peter Day, Victorville Press. Peter Day, photographer for the Victorville Press, captured this amazing scene in California’s Lucerne Valley on September 29. 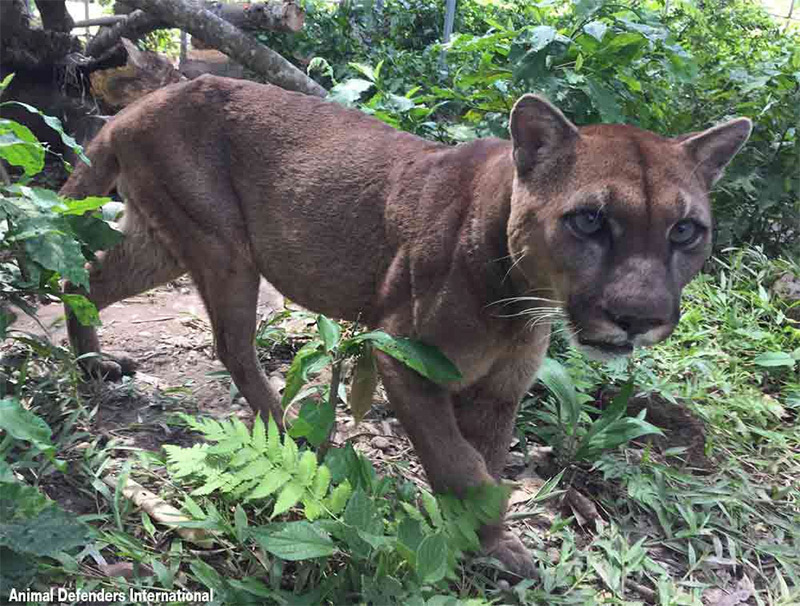 Jose Ruiz, who lives across from the 35-foot utility pole, said he thought the mountain lion got spooked by a noisy group of kids getting off the school bus. The big cat stayed perched atop the pole into the night. 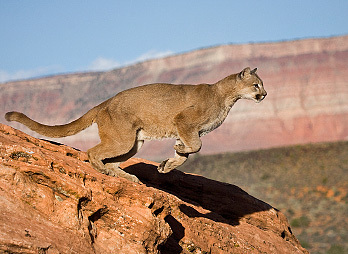 To learn more about mountain lions (also known as cougars, pumas, or panthers), visit our mountain lion facts article. Meet our featured animal: the cougar! Unlike other big cats, the cougar cannot roar. Instead, the large feline purrs like a house cat. The cougar is the second largest cat in North America. Cougars can leap over 6 m (20 ft.). During most of their lives, cougars are solitary creatures. They only interact with one another to mate. 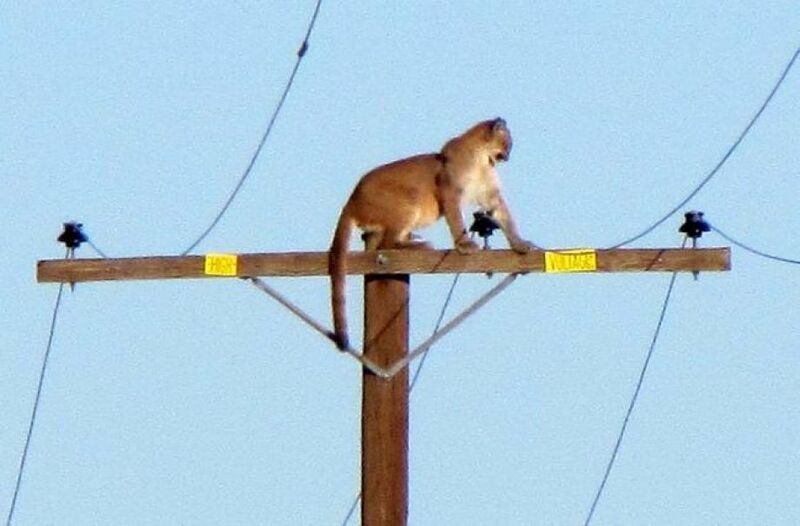 For the most part, the cougar has no natural enemies and sits atop the food chain.